Deacon Nick Donnelly has a post detailing how Protest the Pope supporters have expressed their desire to engage in violence against the Vicar of Christ, Pope Benedict XVI. As I said in a previous post, "John Henry Cardinal Newman, who was truly a prophet, warned more than a hundred years ago of the desolation which we are experiencing today: "Surely there is at this day a confederacy of evil, marshalling its hosts from all parts of the world, organizing itself, taking its measures, enclosing the Church of Christ in a net, and preparing the way for a general apostasy from it..."
We are approaching the day prophesied by Romano Guardini in The Lord, "One day the Antichrist will come: a human being who introduces an order of things in which rebellion against God will attain its ultimate power. He will be filled with enlightenment and strength. The ultimate aim of all aims will be to prove that existence without Christ is possible - nay rather, that Christ is the enemy of existence, which can be fully realized only when all Christian values have been destroyed.." (p. 513). I've warned time and again of the intellectual insecurity of the atheist and where it eventually leads. "Whatever the motives for atheist bloodthirstiness, the indisputable fact is that all the religions of the world put together have in 2,000 years not managed to kill as many people as have been killed in the name of atheism in the past few decades. It's time to abandon the mindlessly repeated mantra that religious belief has been the greatest source of human conflict and violence. Atheism, not religion, is the real force behind the mass murders of history.” (Dinesh D'Souza, "Atheism, Not Religion is the Real Force Behind the Mass Murders of History," The Christian Science Monitor, November 21, 2006; See here). These people are sick with hatred and blinded by their own atheistic fanaticism. 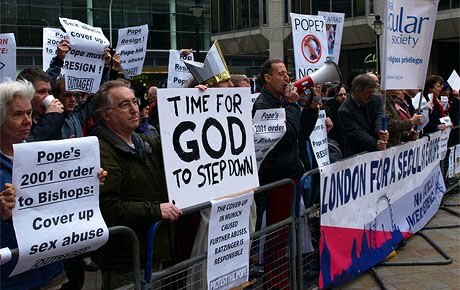 At their website, Protest the Pope has this from Terry Sanderson: "The Pope is no friend to gay people, whatever deluded gay Catholics may say.."
He speaks of Catholics as "deluded" but insists that he and his movement are not anti-Catholic. But the fact that Protest the Pope has supporters who are already agitating for violence says it all: these people are hate-filled bigots. Threatening a major religious figure who is also a Head of State. Doesn't this constitute a threat of domestic terrorism? I hope law enforcement will take the appropriate action and arrest those issuing such threats. And that Protest the Pope will be thoroughly investigated. Our Rosary prayer group will be offering prayers of reparation and intercessory prayers for the safety of His Holiness. This is just evil. Paul King of Protest the Pope left a comment here at La Salette Journey which contains numerous false allegations against the Church. I’m not publishing it since Mr. King makes no attempt to offer any corroborating evidence to back up his laundry list of false accusations. He cannot do so of course. That he doesn’t even try to do so only serves to highlight the fact that even he knows he’s engaging in mindless propaganda. For example, Mr. King accuses the Catholic Church of “formally supporting Hitler.” But anyone with a sense of history knows that the Holocaust was also anti-Christian. After Hitler revealed his true intentions, the Catholic Church opposed him. Even the famous Albert Einstein testified to that. According to the December 23, 1940 issue of Time magazine on page 38, Einstein said:Being a lover of freedom, when the revolution came in Germany, I looked to the universities to defend it, knowing that they had always boasted of their devotion to the cause of truth; but, no, the universities immediately were silenced. Then I looked to the great editors of the newspapers whose flaming editorials in days gone by had proclaimed their love of freedom; but they, like the universities, were silenced in a few short weeks…Only the Church stood squarely across the path of Hitler’s campaign for suppressing truth. I never had any special interest in the Church before, but now I feel a great affection and admiration because the Church alone has had the courage and persistence to stand for intellectual truth and moral freedom. I am forced thus to confess that what I once despised I now praise unreservedly. In another, similar statement, Einstein referred explicitly to the Catholic Church (Lapide, p. 251). This is an extraordinary testimony by an agnostic German scientist of Jewish heritage. Even though there were traitors in her ranks, the Church still opposed the Nazi movement. The December 23, 1940 issue of Time magazine contains an interesting article about Christians living in Germany, both Catholic and Protestant, who opposed and suffered under the Nazis. On page 38, it claims that by late 1940 over 200,000 Christians were prisoners in Nazi concentration camps, with some estimates as high as 800,000. On page 40, it reports on the Archbishop of Munich, Michael Cardinal von Faulhaber, who led the Catholic opposition in Germany against the Nazis. In an Advent 1933 sermon, he preached: “Let us not forget that we were saved not by German blood but by the blood of Christ!” in response to Nazi racism. In 1934 the Cardinal “narrowly missed a Nazi bullet”, while in 1938 a Nazi mob broke the windows in his residence. Even though he was over seventy and in poor health, he still led the Catholic German resistance against Hitler. If this isn’t anti-Catholicism, what else shall we call it? Daniel Greenfield gets it...Obama does not. "I love you means you shall not die."